The present invention provides a virtual keyboard displaying system and method, which are applied to an electronic apparatus. The electronic apparatus comprises a touch screen. The method comprises the following steps: when the touch screen displays an information input interface, detecting and acquiring touch input information on the touch screen, and according to the touch input information, determining whether the touch input is consistent with a preset touch gesture of a calling-out and separating virtual sub-keyboard; and If the touch input is consistent with the preset touch gesture of the calling-out and separating virtual sub-keyboard, then splitting a standard virtual keyboard into two separating virtual sub-keyboards with a preset configuration structure, and displaying the two separating virtual sub-keyboards on the two ends of the touch screen. According to the virtual keyboard displaying system and method provided by the present invention, the two separating virtual sub-keyboards can be displayed on a position close to a thumb, so that a user can smoothly complete the input function by using the thumb under a condition of holding the electronic apparatus with two hands. 本发明涉及虚拟键盘的显示领域，特别涉及一种虚拟键盘显示系统及方法。  Display Field The present invention relates to a virtual keyboard, more particularly to a system and method for displaying a virtual keyboard. 目前的手机、平板电脑等电子装置大多采用触摸屏配合虚拟键盘进行信息的输入。  Current mobile phones, tablet computers and other electronic devices they use a touch screen with virtual keyboard input information. 在输入信息时，一般是采用双手的四指分别握持电子装置的两端，用两个拇指触压虚拟键盘进行信息的输入。 When the input information is generally used four fingers of both hands holding the respective ends of the electronic device, the virtual keyboard input information with both thumbs contact pressure. 然而，随着手机及平板电脑的屏幕尺寸越来越大，屏幕显示的虚拟键盘的尺寸也相应越来越大。  However, as mobile phones and tablet screen size is growing, the screen displays the size of the virtual keyboard is correspondingly growing. 现有的虚拟键盘的位置是根据屏幕尺寸均匀分布的，其按键的位置也是固定的。 Location of the existing virtual keyboard is uniformly distributed according to the screen size, the position of the key which is also fixed. 不同的用户之间由于手掌大小以及手指长短均不同，按键位置固定的虚拟键盘，尤其是尺寸相对较大的平板电脑的虚拟键盘往往无法满足不同用户的需求。 Since different user hand size and finger length are different, the key position of the fixed virtual keyboard, in particular the relatively large size virtual keyboard tablet often unable to meet the needs of different users. 例如，当用户手型较小，若其用双手握持平板电脑两端的方式进入信息输入时，往往其拇指无法触及到平板电脑中间的虚拟按键。 For example, when the type of the user's hand is small, if the ends thereof gripping Tablet PC way into the information input with both hands, the thumb which often can not touch tablet computer virtual key intermediate. 有鉴于此，有必要提出一种虚拟键盘显示系统，以便用户在双手握持该电子装置的情况下能够使用拇指来顺利完成输入功能。  In view of this, it is necessary to provide a virtual keyboard display system, so that in the case where the user of the electronic device is held with both hands to use thumb input function successfully completed. -种虚拟键盘显示系统，运行于一电子装置中，该电子装置包括一触摸屏。  - Species virtual keyboard display system runs in an electronic device, the electronic device includes a touch screen. 该系统包括触摸侦测模块、触摸识别模块及显示模块。 The system includes a sensing module, a touch recognition module and a display module. 该触摸侦测模块用于当该触摸屏显示一信息输入界面时，侦测并获取该触摸屏上的触摸输入信息。 The sensing module configured to, when the touch screen displays a message input interface, and acquires the detection of the touch input on the touch screen of information. 该触摸识别模块用于根据该触摸输入信息判断该触摸输入是否与一调出分离式虚拟子键盘的预设触摸手势一致。 The touch recognition module according to the touch input information and determining whether the touch input is transferred out a split virtual keyboard coincides sub preset touch gesture. 该显示模块用于在该触摸输入与该调出分离式虚拟子键盘的预设触摸手势一致时，将一标准虚拟键盘拆分为两个具有预设配置结构的分离式虚拟子键盘，并在该触摸屏的两端显示该两个分离式虚拟子键盘。 The display module for the touch input to call up the split virtual keyboard sub coincides preset touch gesture, the virtual keyboard is a standard split into two separate type having a predetermined arrangement of the virtual sub-keyboard, and ends of the touch screen display of the two sub-split virtual keyboard. 还有必要提出一种虚拟键盘显示方法，以便用户在双手握持该电子装置的情况下能够使用拇指来顺利完成输入功能。  there is a need to provide a method for displaying a virtual keyboard so that the user can use the thumb of the holding hand in the case of the electronic device to the successful completion of an input function. -种虚拟键盘显示方法，应用于一电子装置中，该电子装置包括一触摸屏。  - Species virtual keyboard display method applied to an electronic device, the electronic device includes a touch screen. 该方法包括步骤：当该触摸屏显示一信息输入界面时，侦测并获取该触摸屏上的触摸输入信息； 根据该触摸输入信息判断该触摸输入是否与一调出分离式虚拟子键盘的预设触摸手势一致；若该触摸输入与该调出分离式虚拟子键盘的预设触摸手势一致，则将一标准虚拟键盘拆分为两个具有预设配置结构的分离式虚拟子键盘，并在该触摸屏的两端显示该两个分离式虚拟子键盘。 The method comprising the steps of: when the touch screen displays a message input screen, detects and acquires a touch input information on the touch screen; input information based on the touch determining whether the touch input with a recall split virtual sub keyboard preset touch consistent gesture; if the touch input is transferred out to the same sub-split virtual keyboard preset touch gesture, then a standard virtual keyboard is split into two with a predetermined arrangement of sub-split virtual keyboard and the touch screen the ends of the two display sub-split virtual keyboard. 本发明的虚拟键盘显示系统及方法，可将两个分离式虚拟子键盘显示在靠近拇指的位置，以便用户在双手握持该电子装置的情况下能够使用拇指来顺利完成输入功能。  The virtual keyboard of the present invention, a display system and method can be two separate sub virtual keyboard displayed at a position near the thumb, so that the user can use the thumb of the holding hand in the case of the electronic device to the successful completion of an input function. 图1是本发明一实施方式中的虚拟键盘显示系统的应用环境示意图。  FIG. 1 is a block diagram of one embodiment of an application system of the present invention the virtual keyboard display. 图2是本发明一实施方式中的虚拟键盘显示方法的流程图。  FIG. 2 is an embodiment of the present invention, the virtual keyboard a flowchart of a method embodiment of the display. 图3是本发明一实施方式中的分离式虚拟子键盘的结构示意图。  FIG. 3 is a schematic separate embodiment of a virtual keyboard sub-embodiment of the present invention. 如图1所示，是本发明一实施方式中的虚拟键盘显示系统20的应用环境示意图。  As shown in FIG 1, is a block diagram of a system 20 according to an embodiment of the present invention the virtual keyboard display. 在本实施例中，该虚拟键盘显示系统20安装并运行于一电子装置100中。 In the present embodiment, the virtual keyboard display system 20 is installed and running in the electronic device 100 a. 该电子装置100 还包括，但不限于，触摸屏30、存储器40和处理器50。 The electronic device 100 further includes, but not limited to, a touch screen 30, memory 40 and processor 50. 在本实施例中，该电子装置100可以是智能手机、平板电脑、电子书等设备。 In the present embodiment, the electronic device 100 may be a smart phone, a tablet computer, and other equipment. 该存储器40用于存储一调出分离式虚拟子键盘的预设触摸手势。 The memory 40 for storing a recall split virtual keyboard sub preset touch gesture. 该处理器50用于控制电子装置100工作。 The processor 50 is used to control operation of the electronic device 100. 该虚拟键盘显示系统20用于当该触摸屏30显示一信息输入界面，且用户在该触摸屏30上输入该调出分离式虚拟子键盘的预设触摸手势时，自动将一标准虚拟键盘拆分为两个具有预设配置结构的分离式虚拟子键盘后显示于该触摸屏30两端，并根据用户输入的移动手势移动该分离式虚拟子键盘。  The virtual keyboard display system 20 for, when the touch panel 30 displays a message input interface, and the user enters the call up separate virtual sub keyboard preset touch gesture on the touch screen 30 is automatically a standard virtual keyboard It is split into two split structure having a predetermined configuration is shown in both ends of the touch panel 30 after the virtual sub-keyboard, and a user input gesture moving in accordance with movement of the sub-split virtual keyboard. 在本实施例中，该虚拟键盘显示系统20包括触摸侦测模块21、触摸识别模块22以及显示模块23。  In the present embodiment, the virtual keyboard display system 20 includes a sensing module 21, a touch recognition module 22 and a display module 23. 本发明所称的模块是指一种能够被电子装置100的处理器50所执行并且能够完成特定功能的一系列程序指令段，其存储在电子装置100的存储器40中。 The present invention refers to a referred module is capable of being a processor 50 of the electronic device 100 can be performed to complete the series of program instructions and segment specific function, which is stored in the memory 40 of the electronic apparatus 100. 关于各模块21-23的功能将在下图2的流程图中具体描述。 21-23 the function of each module on to the flowchart of FIG. 2 below specifically described. 如图2所示，是本发明一实施方式中的虚拟键盘显示方法的流程图。 As shown in FIG. 2 , it is a flowchart of an embodiment of the present invention the virtual keyboard display. 步骤201，请一并参阅图3,当该触摸屏30显示一信息输入界面60时，该触摸侦测模块21侦测并获取该触摸屏30上的触摸输入信息。  Step 201, Referring to FIG. 3, 60, 21 of the sensing module detects and acquires information of a touch input on the touch screen 30 when the touch screen 30 displays a message input screen. 步骤202,该触摸识别模块22根据该触摸输入信息判断该触摸输入是否与该调出分离式虚拟子键盘的预设触摸手势一致。  Step 202, the touch input recognition module 22 determines whether the touch input information to the tune the split virtual keyboard coincides sub preset touch gesture according to the touch. 若该触摸输入与该调出分离式虚拟子键盘的预设触摸手势一致，则执行步骤203 ;否则，返回步骤201。 If the touch input to call up the split virtual keyboard sub consistent with a preset touch gesture, execute step 203; otherwise, it returns to step 201. 在本实施方式中，该调出分离式虚拟子键盘的预设触摸手势为用户用手指，例如两个拇指在该触摸屏30的两端同时触摸，例如单击或双击该信息输入界面60。  In the present embodiment, the sub-tune the split virtual keyboard preset touch gesture is a user with a finger, for example, two thumbs simultaneously touch both ends of the touch screen 30, such as click or double the information input interface 60. 步骤203,该显示模块23将一标准虚拟键盘拆分为两个具有预设配置结构的分离式虚拟子键盘31及32,并在该触摸屏30的两端显示该两个分离式虚拟子键盘31及32。  Step 203, the display module 23 to a standard virtual keyboard is split into two separate type having a predetermined arrangement of the virtual keyboard 31 and the sub 32, and displays the two ends of the split virtual touch screen 30 in the 31 and 32 the sub-keyboard. 在其他实施方式中，该存储器40中还预先存储有一调出标准虚拟键盘的预设触摸手势。  In other embodiments, the memory 40 further stores in advance a virtual keyboard of a standard tune preset touch gesture. 该调出标准虚拟键盘的预设触摸手势为用户用手指，例如一个食指触摸，例如单击或双击该触摸屏30显示的输入界面。 The standard virtual keyboard to call up the default for users with a finger touch gesture, such as a finger touch, such as clicking or double-click the touch screen input interface display 30. 在其他实施方式中，若该触摸输入与该调出标准虚拟键盘的预设触摸手势一致， 则该显示模块23在该触摸屏30上的一预设位置，例如该触摸屏30的底部显示一完整的标准虚拟键盘。  In other embodiments, if the touch input with the tone of a standard virtual consistent keyboard preset touch gesture, that displays a predetermined position of the module 23 on the touch screen 30, such as shown at the bottom of the touch screen 30 a full QWERTY virtual keyboard. 步骤204,该触摸侦测模块21继续侦测并获取该触摸屏30上的触摸输入信息。  Step 204, the sensing module 21 continues to detect and obtain information of a touch input on the touch screen 30. 步骤205,该触摸识别模块22根据该触摸输入信息判断该触摸输入是否为触摸， 例如单击或双击并拖曳该虚拟子键盘61或62的移动手势。  Step 205, the touch input information recognition module 22 determines whether the touch input is a touch or double-clicking and drag e.g. the virtual keyboard sub-move gesture 61 or 62 according to the touch. 若该触摸输入为触摸并拖曳该虚拟子键盘61或62的移动手势，则执行步骤206 ;否则，返回步骤204。 If the touch input is a touch and drag gesture moving the virtual sub keyboard 61 or 62, execute step 206; otherwise, it returns to step 204. 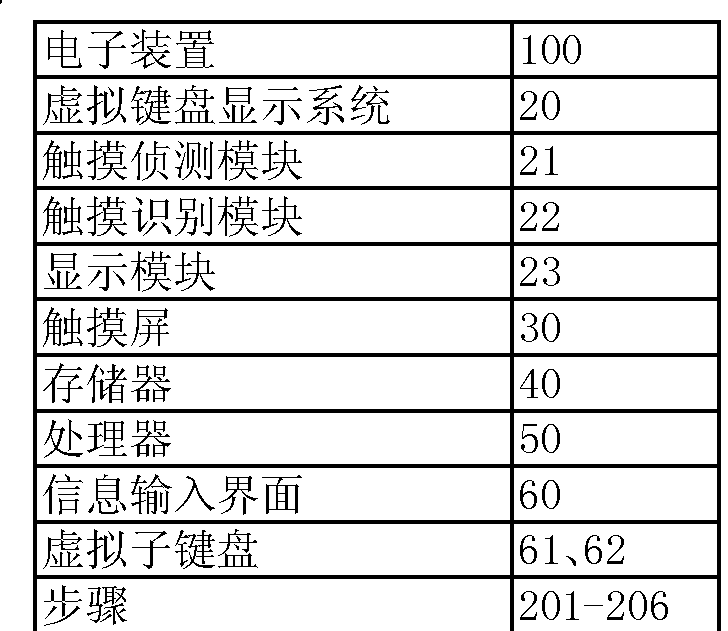 步骤206,该显示模块23控制被触摸的虚拟子键盘61或62跟随该移动手势移动至一新的位置。  Step 206, the display module 23 controls the touched virtual sub keyboard 61 or 62 follows the movement gesture moves to a new location. 在其他实施方式中，该显示模块23还在其中一个虚拟子键盘被拖动至与另一个虚拟子键盘接触时，将该两个虚拟子键盘31及32合成一完整的标准虚拟键盘。  In other embodiments, the display module 23 also wherein a virtual keyboard is dragged to the child when the child another virtual keyboard contacting the two virtual sub-standard keyboard and a complete virtual keyboard 31 32 Synthesis of . 本发明的虚拟键盘显示系统及方法，可将一标准虚拟键盘拆分为两个具有预设配置结构的分离式虚拟子键盘并显示于该触摸屏两端，还可根据用户输入的移动手势移动该分离式虚拟子键盘，从而可将虚拟子键盘显示在靠近拇指的位置，以便用户在双手握持该电子装置100的情况下能够使用拇指来顺利完成输入功能，并提高用户体验效果。 Virtual keyboard system and method  according to the present invention display a standard virtual keyboard may be split into two with a predetermined arrangement of the split virtual keyboard and displayed on the sub ends of the touch screen, the mobile user may input gesture to move the sub-split virtual keyboard, so that the virtual keyboard can be sub-display position close to the thumb, so that the case where the user holds the electronic device 100 can use a thumb to the successful completion of an input function in hands, and improving the user experience. 最后应说明的是，以上实施例仅用以说明本发明的技术方案而非限制，尽管参照较佳实施例对本发明进行了详细说明，本领域的普通技术人员应当理解，可以对本发明的技术方案进行修改或等同替换，而不脱离本发明技术方案的精神和范围。  Finally, it should be noted that the above embodiments are intended to illustrate and not limit the present invention, although the present invention has been described in detail with reference to preferred embodiments, those of ordinary skill in the art should be understood that the present invention the technical solution changes or modifications without departing from the spirit and scope of the technical solutions of the present invention. 1. 一种虚拟键盘显示系统，运行于一电子装置中，该电子装置包括一触摸屏，其特征在于，该系统包括： 触摸侦测模块，用于当该触摸屏显示一信息输入界面时，侦测并获取该触摸屏上的触摸输入信息； 触摸识别模块，用于根据该触摸输入信息判断该触摸输入是否与一调出分离式虚拟子键盘的预设触摸手势一致； 显示模块，用于在该触摸输入与该调出分离式虚拟子键盘的预设触摸手势一致时，将一标准虚拟键盘拆分为两个具有预设配置结构的分离式虚拟子键盘，并在该触摸屏的两端显示该两个分离式虚拟子键盘。 A virtual keyboard display system, running on an electronic device, the electronic device includes a touch screen, characterized in that the system comprising: a sensing module, configured to, when the touch screen displays a message input interface, detection and obtaining the touch input on the touch screen information; touch recognition module, based on the input information for determining whether the touch input with a touch recall consistent sub-split virtual keyboard preset touch gesture; a display module for the touch input to the sub-tune the split virtual keyboard coincides with a preset touch gesture, the virtual keyboard is a standard split into two separate type having a predetermined arrangement of the virtual sub-keyboard, and display the two ends of the touch screen in a split virtual keyboard child. 2. 如权利要求1所述的系统，其特征在于，该调出分离式虚拟子键盘的预设触摸手势为用户用手指在该触摸屏的两端同时触摸该信息输入界面。 2. The system according to claim 1, characterized in that the sub-tune the split virtual keyboard preset touch gesture for the user simultaneously touches with a finger at both ends of the information input interface of the touch screen. 3. 如权利要求1所述的系统，其特征在于，该触摸侦测模块还用于在该触摸屏显示两个分离式虚拟子键盘后继续侦测并获取该触摸屏上的触摸输入信息； 该触摸识别模块还用于根据该触摸输入信息判断该触摸输入是否为触摸并拖曳该虚拟子键盘的移动手势；及该显示模块还用于在该触摸输入为触摸并拖曳该虚拟子键盘的移动手势时，控制被触摸的虚拟子键盘跟随该移动手势移动至一新的位置。 3. The system according to claim 1, wherein the sensing module is further configured to display the touch screen two separate touch input continues to detect and obtain information on the touch screen after the virtual sub-keyboard; touch the when the display module is further configured and the touch input is a touch and drag the virtual keyboard sub-move gesture; identification module is further based on the touch input information for determining whether the touch input is a touch and drag the virtual keyboard sub-move gesture , the touched virtual sub-control keyboard follows the movement gesture moves to a new location. 4. 一种虚拟键盘显示方法，应用于一电子装置中，该电子装置包括一触摸屏，其特征在于，该方法包括步骤： 当该触摸屏显示一信息输入界面时，侦测并获取该触摸屏上的触摸输入信息； 根据该触摸输入信息判断该触摸输入是否与一调出分离式虚拟子键盘的预设触摸手势一致； 若该触摸输入与该调出分离式虚拟子键盘的预设触摸手势一致，则将一标准虚拟键盘拆分为两个具有预设配置结构的分离式虚拟子键盘，并在该触摸屏的两端显示该两个分离式虚拟子键盘。 A virtual keyboard display method applied to an electronic device, the electronic device includes a touch screen, characterized in that, the method comprising the steps of: when the touch screen displays a message input interface, and acquires the detection on the touch screen the touch input information; information based on the touch input if the touch input is determined to call a consistent sub-split virtual keyboard preset touch gesture; if the touch input is transferred out to the same sub-split virtual keyboard preset touch gesture, then a standard virtual keyboard is split into two with a predetermined arrangement of sub-split virtual keyboard, and displaying the two sub-split virtual keyboard at both ends of the touch screen. 5. 如权利要求4所述的方法，其特征在于，该调出分离式虚拟子键盘的预设触摸手势为用户用手指在该触摸屏的两端同时触摸该信息输入界面。 5. The method according to claim 4, characterized in that the sub-tune the split virtual keyboard preset touch gesture for the user simultaneously touches with a finger at both ends of the information input interface of the touch screen. 6. 如权利要求4所述的方法，其特征在于，还包括步骤： 继续侦测并获取该触摸屏上的触摸输入信息； 根据该触摸输入信息判断该触摸输入是否为触摸并拖曳该虚拟子键盘的移动手势； 若该触摸输入为触摸并拖曳该虚拟子键盘的移动手势，则控制被触摸的虚拟子键盘跟随该移动手势移动至一新的位置。 6. The method according to claim 4, characterized in that, further comprising the step of: continuing to detect and obtain information of a touch input on the touch screen; touch input information based on the determination whether the touch input is a touch and drag the virtual keyboard sub the movement gesture; if the touch input is a touch and drag the virtual keyboard sub-move gesture, then the control sub-virtual keypad is touched following the movement gesture moves to a new location.